I am going to a Black Tie wedding next summer and I already can't wait for the January sales. I'm going to buy a full-length show-stopper and I'm not going to regret it. (Right?) I was on a recon mission last weekend and popped into Pamela Scott on Grafton Street because I found the most gorgeous gúna in the window. It's black, strapless and with a poofy mid-length skirt - very Audrey Hepburn in Givenchy. It won't quite work for the black tie wedding I'm going to in July, but it would be perfect if it was in any of the winter months. Why can't it come in a light blue? Why? The colour you pair with your black dress doesn't have to be particularly bright or, actually, colourful. Sometimes 'pops of colour' can look forced and intentional, when you want to look effortless. I would go with silver or gold accents, including shoes, or I would wear bright pink shoes, complemented by more subtle accessories. 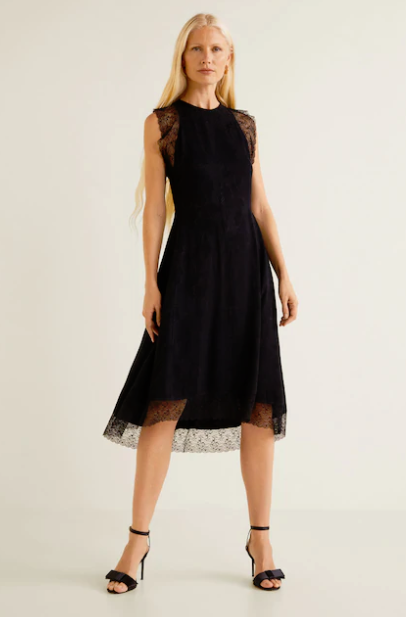 These dresses are not particularly funereal and, as is the beauty with black pieces, they can be interpreted in many ways for many different occasions. How would you style yours? Would you wear black to a wedding? Do you it's ever acceptable?